3 years ago today, Wong sifu passed away. In memory of him, I am reposting an interview. 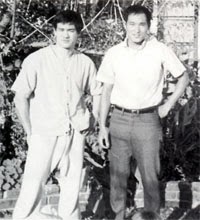 Close friends: Bruce Lee (TM) (left) and Ted Wong (right) became fast friends shortly after their first meeeting in 1967. Here they take "five" from a backyard workout at Bruce's house long enough to pose for a quick snap shot. 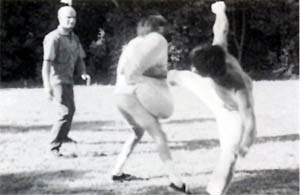 Ted Wong probably spent more time with Bruce Lee (TM) during the development of his art of Jeet Kune Do (TM) than any other individual presently living. More importantly, the two men became great friends and more often than not what little spare time they had was spent in each other's company. Ted received certification in Jeet Kune Do (TM) directly from Bruce Lee (TM) himself and was Bruce Lee's (TM) last private student. In looking at Bruce Lee's (TM) daytime diary for the year 1967, one sees that Ted Wong was first invited to Bruce's home on April 20th of that year. This would prove to be, in the words of Humphrey Bogart, "the beginning of a beautiful friendship," that would endure up until Bruce Lee (TM) passed away on July 20, 1973. For years Ted Wong has taught privately, usually to only a handful of dedicated individuals who would make the trip to his home in Monterey Park, California to train in Ted's backyard. He is a humble man, a dedicated man, and a man fiercely loyal to Bruce Lee (TM), in terms of both the art he taught and the message he communicated. Linda Lee Cadwell recollects that Ted's teaching is perhaps the purest strain of her late husband's art and is quick to seek Ted's counsel on matters pertaining to the technical aspects of Jun Fan Jeet Kune Do (TM). Ted Wong is also, as were all of Bruce 's closest friends, the most decent of human beings. Time and again he has foregone payment at seminars, and even gone into his own pocket in an effort to help spread the teachings of his sifu, Bruce Lee (TM). In this day and age, such altruism is considered shocking. When Ted Wong speaks, he speaks with the air of unimpeachable authority, and we at "Knowing Is Not Enough "are very pleased to be able to present this in-depth interview with Ted Wong to our readers and members ol Jun Fan Jeet Kune Do (TM). For the benefit of some of our members who may not know, how did you first meet Bruce Lee (TM)? TED WONG: I first met him the day that he opened up his Chinatown School. I'd actually been around him some six months prior to that, but Ididn't have an opportunity to introduce myself to him. TED WONG: He was training with a couple of his students in Chinatown. At that time it was just a big room in a theater that was used as a recreation room by the Chinese community in Los Angeles. People would go there to play chess and ping pong, and Bruce Lee (TM) used that same place to go and train. A friend of mine had told me about it and that was actually how I first heard about Bruce Lee (TM). So I went there on a couple of occasions but just sort of stayed in the background and watched him. I was a little too intimidated to just walk up and introduce myself. And then a few months later, February of 1967 to be exact, it was on a Saturday morning, my same friend told me that Bruce Lee (TM) was opening a school. And that was the first time that I formally met him. What was Bruce Lee (TM) doing during that "opening day" ofthe Chinatown school? TED WONG: He was giving a lecture and talking about his art. It was really quite an eye-opener for me listening to him talk about his Gung Fu. It wasn't Jeet Kune Do (TM) when the Chinatown school first opened, he hadn't yet coined the term [Editor's note: According to Bruce Lee's (TM) daytime diaries, the Chinatown school opened "officially" as the"Jun Fan Gung Fu Institute" on Thursday, February 9, 1967 one month before the official cancellation of The Green Hornet TV series. It was on Sunday, July 9,1967, some five months later, that the art of "Jeet Kune Do (TM)" was conceived]. I was fortunate enough to be there and to sign up for his class, and the rest is history. Bruce Lee (TM) (background, lecturing). Had you been training long at the Chinatown school when Bruce Lee (TM) took you as a private student? TED WONG: No. In fact, he came up to me in that very first class and asked me my name, and where I came from. When I told him I came from Hong Kong, he knew that I spoke Cantonese. At that time there were probably only two or three Chinese people in his class, so he took me out for a cold drink and started talking to me. I really didn't have any previous experience in the martial arts, and he knew this. I think he kind of felt sorry for me, so he gave me some advice at that time. I remember later that he once told me,"Ted, you need to work on your basic requirements." Ididn't know what he meant by this, and so I asked him, "What's that?" Bruce just smiled and said, "Well, you need some muscle." (Ted laughs). 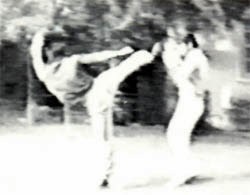 A backyard workout: Bruce Lee (TM) (Ieft) shows Ted Wong (right) the fundamentals of landing a hook kick on a moving target (circa 1968). So, he said, "Why don't you come over to my house and I'll get you fixed up in that department." So I went to Bruce Lee's (TM) house and he drove me over to a place that sold barbell sets, and nutritional products. The York Barbell Club owned the store and Bruce Lee (TM) had me buy some "Crash Weight Gain" powder and a goodbasic barbell set. Who manufactured the weight gain product? TED WONG: Bob Hoffman, who used to publish Strength & Health magazine, manufactured it. I purchased two cases of the weight gain powder. I remember that the directions called for me to take "one can a day." Bruce also had me purchase a bench press and then he set up a special program for me to train on. Do you remember what that program consisted of? TED WONG: Well, basically it was just a general conditioning program consisting of bench presses, press-behind-the-neck, deadlifts, bent-over rows, squats, sit-ups, curls, reverse curls, and things like that. I perforrned two sets of 10 repetitions per exercise and worked up in reps, but I never performed more than 20 repetitions. This routine was perforrned three days a week with the weights, and then I did two days a week with martial art. How well did the program work for you in "putting on muscle? TED WONG: It worked really well! Bruce Lee (TM) weighed me first and then constantly checked my progress to see how much weight and size I increased. I believe that in three months I went from 132 pounds to 147 pounds -- a total of 15 pounds gained -- and it was all muscle. It was the heaviest I've ever been. I found, however, that if I didn't keep taking the weight gain powder and hitting the weights that I couldn't maintain that bodyweight. How long did it take you to notice progress in your martial arts training once you started training privately with Bruce Lee (TM)? TED WONG: Pretty much right away. I was pretty gung-ho and pretty intense. The way that Bruce Lee (TM) spoke and taught you conveyed that he meant serious business. He always tried to condition your mind to try and give you the proper example ofhow to train. Bruce had me running with him in addition to the martial arts and weight training, and then I'd go out to the stores with him to get certain types of vitamins. He would tell me what to get and what they did for your body. Were there any other physical fitness devices that Bruce Lee (TM) thought would be helpful for the martial artist? TED WONG: Bruce Lee (TM) always was working on ways to improve his supplemental conditioning for the martial arts. I remember that he had me buy a weighted belt -- not a weightlifting belt, but a belt that weighed about 10 pounds that you wore around your waist. He had me run with that as a forrn of progressive resistance to both the muscles and the cardiovascular system, as both the heart and the muscles had to work harder to carry my body over the distance I was running with this additional weight. I even sparred wearing that. I didn't really know at the time how quick my progress was, but because of his personal attention and advice, I really began to progress quite quickly and catch up to the level of the rest of the students. You were also in the unique position of being, not only one of Bruce Lee's (TM) closest students, but also one of his closest friends. Can you comment on this? TED WONG: Well, I just feel that I was tremendously fortunate. I'm very thankful to this day. When you think about having the opportunity to study martial art from Bruce Lee (TM), I've got to be one of the luckiest guys in the world, particularly since he taught me when I had no previous martial art experience. Bruce Lee (TM) usually only taught people that already had experience in martial arts. He took me in and made me not only his private student, but also his friend. When not teaching, Bruce Lee (TM) would often use Ted to practice his choreography techniques, such as this spinning wheel kick, performed to check optimal camera angles to capture martial arts movements. Something else that I find interesting, and that many of our members may not be familiar with, is that you were actually with Bruce Lee (TM) on the day that he founded the name "Jeet Kune Do (TM). " Could you tell us that story? TED WONG: Well, it's both a very long story and a very short story (laughs). One day Bruce Lee (TM) came up to me and during the course of our discussion the said that he wanted to come up with a name that would really identify his own arto He had been doing a lot of thinking about it, he told me, and wanted to have a name for -- I shouldn't say his "style" because he never believed in style or system -- but in his way of fighting. It was all his own and had evolved to the point where he thought he should have a name to identify his own art. So, that's why Ithink at that time he chose the name "Jeet Kune Do (TM)." He named it in Chinese first, and he said that he thought the name was really appropriate. And then he said that he wanted to go up to UCLA where one of his friends was a linguistics professor and who would know what the correct phonetic spelling of it would be in English. This was around July of 1967. When he named his art "Jeet Kune Do (TM), " was that because at that time his art laid specific emphasis upon "interception (i.e.., the "Jeet " in Jeet Kune Do (TM)), rather than on, say, a "block and then strike" combination, such as were to be found in most of the other martial arts styles of the time? TED WONG: I think interception was the comerstone of Bruce Lee's (TM) art at that time, but interception can be applied in many ways. It doesn't mean blocking, and yet it also can serve as a block or a preventative measure in avoiding an oncoming blow. Intercept means to stop your opponent as he progresses or even before he begins to progress in his attack. I think that most arts were based on attacking and defending, but intercepting was certainly one of the foremost principles of Jeet Kune Do (TM) at that time. You spent a tremendous amount of time with Bruce Lee (TM), particularly during the period when he considered -- however briefly -- Jeet Kune Do (TM) to be both a style and an art. When it was "an art," how did it differ from what was taught at, say, the Chinatown school? TED WONG: Well, I did have the very, very good fortune to learn from him in both the Chinatown school and also privately when we worked out at his home. That's why I had the opportunity to experience both aspects of his teaching, both formally and informally and at both "schools," so to speak. I can see that I came along probably toward the end of his period of development of his art of Jeet Kune Do (TM). And I can see that most of his teaching during the early part of his development was pretty much Wing Chun Gung Fu. Later on, he started adding different things to it such as footwork, and applying different combative philosophies to it. The art at that point began changing, but the change wasn't simply the result of adding new and different techniques and different approaches, but I could see that, technique-wise, it was pretty much the same. I recently had the opportunity to workout with members of the Jun Fan Jeet Kune Do (TM) Nucleus; that is, different members who had actually trained with Bruce Lee (TM) over many different eras. This gave me the opportunity to see that the techniques that Bruce taught all of his students were pretty much the same, as far as punching and kicking. Over time, he began to change the stance from a Wing Chun Bai Jong to the "On-Guard" position, and because of that change, many other changes came about. For instance, he changed the way he kicked and punched, the delivery system of these techniques. Also, the curriculum that he taught in the class to a large group of people began to change somewhat. Still at that time, the Seattle, Oakland and Los Angeles curriculums were pretty much still Wing Chun influenced. But when I was training with him privately, there was a gradual diminishing of Wing Chun until, at the end, it was completely different than Wing Chun. Pretty much the only Wing Chun element that he applied was Chi Sao or "sticking hands" and also some simplified trapping. He thought that it was pretty unique, but then later, say, in 1969, he had pretty much discarded that as well. Taky [Kimura] told me that Bruce had called him in 1969 and told him that "Chi Sao is out." It's interesting that there was a difference in what he taught you privately --not just from the Seattle school's curriculum, but also from the Chinatown school, both of which emphasized trapping, Chi-Sao, and the classical techniques of Wing Chun. Whereas by 1969 he was getting away from that. TED WONG: Yeah, in his private teaching there was still a little bit of Wing Chun there but it was no longer the center ofhis art. I think once he started to move away from it was when he really started to excel; that was how he progressed so quickly on his own. I think that he believed that the Wing Chun techniques no longer fit into the direction he was progressing in at that time; that is, into the structure of JKD anymore. However, Wing Chun remains an important part of the early history of Jun Fan Jeet Kune Do (TM). I should also emphasize that this is only my personal opinion of how he felt. All right, let me ask you a direct question: How would you define Jeet Kune Do (TM)? 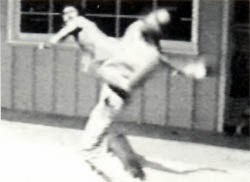 TED WONG: To me leet Kune Do is Bruce Lee's (TM) own personal way of how to conduct himself in combat. Jeet Kune Do (TM) is based upon certain principIes and a philosophy, and how to apply them both through physical movement or motion. I also believe that if you are going to use the term "Jeet Kune Do (TM)" you should be referring to what Bruce Lee (TM) taught and did during his lifetime. Jeet Kune Do (TM), really, represented the process of Bruce Lee's (TM) evolvement ever since he began martial art. I cannot say that Jeet Kune Do (TM) really began on the day that he first carne up with the term, that was just the day that he decided to give the process of his evolvement a name. Jeet Kune Do (TM) was that process of evolution, even in Seattle, Washington right up until his last day on earth. All of these have to be considered part of his Jeet Kune Do (TM) process. I don't think that you can pin down Jeet Kune Do (TM) as being what he taught from July 1967 and onward, and that anything he taught before then was not. I think Jeet Kune Do (TM) would have to be what Bruce Lee (TM) was practicing, doing, teaching and working on during his lifetime. It is really based upon some really important philosophical principals: simplicity, directness and non-classicalness. If you understand these, you will probably understand a lot of Jeet Kune Do (TM). You also feel that there are some fundamental techniques that form the science of the art of Jeet Kune Do (TM), as opposed to the art itself; which is oriented more toward the personal experience of the individual. Can you share with us some of what you hold to be the fundamental techniques that underlay the science of Jeet Kune Do (TM)? TED WONG: Well, Bruce Lee (TM) always mentioned that the footwork and stance are very, very important. You have to learn these, especially at the beginning, before you can progress on to anything else. Bruce Lee (TM) always emphasized that the On-Guard position and footwork are really the fundamental keys to Jeet Kune Do (TM). These are really the fundamental building blocks of the art, the foundation of it. So if someone were studying Jeet Kune Do (TM) and paid particular attention to developing the On-Guard position and footwork, you would feel that they were well on their way to a solid comprehension of Bruce Lee's (TM) art of Jeet Kune Do (TM)? TED WONG: Yes, those are the basic fundamentals of JKD. I wasn't able to grasp that intellectually until only fairly recently, but I always sensed that this was the truth on an emotional level. I lived by that: the basic fundamentals and how to apply them through phisical motion. And I was delighted to learn recently that you discovered that hidden page within the book in Bruce Lee's (TM) Library entitled "Concentration", wherein Bruce Lee (TM) wrote: "What is the root of JKD?". And then he went on to answer that question by writing: "The On-Guard position, footwork, mobility, body alignment, coordination" and so on. And that's what it is. One of the most important principles of JKD was revealed in Bruce Lee's (TM) saying that "True refinement seeks simplicity". Thas has always stuck in my mind, to take something that you already know and try to refine it further. You will end up being simple. I know that a lot of people are saying that "What Ted Wong teaches is too simple," but I'm glad they are saying that. 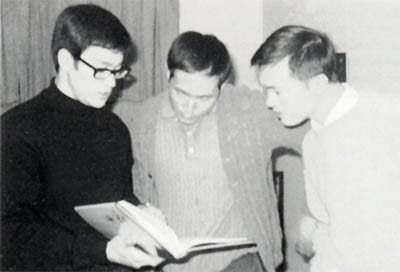 Bruce Lee (TM) (left) and Ted Wong (center) shared many great times together, inc1uding this Christmas during 1967. Also present was Ted's c1ose friend, Raymond Huang (right). 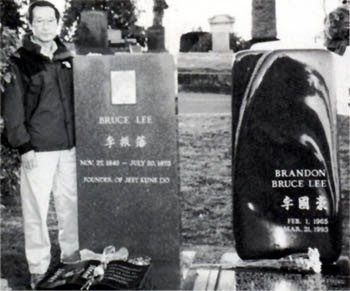 You not only spent a lot of time with Bruce Lee (TM) when he lived in Los Angeles, but you also went to visit him in Hong Kong after he had shot his scenes for The Game of Death, and before he began filming Enter the Dragon. And then you saw him again when he returned to Los Angeles for the last time approximately one month before he died. Did he share any new developments in the art of Jeet Kune Do (TM) with during those last get-togethers? TED WONG: He always liked to share what he was working on. He liked to talk to his own students, like Herb Jackson, James Lee and myself. He couldn't wait to call us up whenever he carne back to town and just get back into our old routines again, going to bookstores, and just hanging around and showing us what he was doing at that time. Herb and I went to visit him in December of 1972. We stayed at his home and shared Christmas and New Year of 1973 with Bruce and his family. At that time, he said, "Boy, you guys got here at just the right time. This is the most peaceful and relaxed moment I've had since I got here [in Hong Kong]. I'm in between movies and have a bit of spare time to relax and talk." Wewere actually there to attend the premiere of The Way of the Dragon. Thilt was very exciting, they hold their premieres at midnight in Hong Kong. I enjoyed that movie very much. What was Bruce Lee's (TM) feelings with regard to the Hong Kong fans' reaction to his film at the time? TED WONG: Oh he was very excited, because that was the movie that he was really proud of. He had written it, he had directed it, and he was the star of it. It was his baby. I think that movie had more JKD in it than any other movie he did. It really represented his thinking, his way of martial art. When you last saw Bruce in May of 1973, did he mention to you that he had chosen a "successor," or any one person who he had entrusted to carry on his art during his absence? TED WONG: No, he never said anything like that. I don't think he ever saw any one person as his successor. He had big plans for himself and had no idea that he wouldn't be around to handle things himself for a long time to come. What is the strongest image that comes to your mind when you think of Bruce Lee (TM)? TED WONG: I see a very dedicated man at whatever he did, not just in martial art. I think he put so much tie and enegy into martial art, but what he really wanted to do was to reveal the higher principles of martial arts through movies. Because of that, he sacrificed a lot financially to achieve his goal, but tha, and his family were his loves. His family came first, and he told me tha: "If I do good in my martial art, if I can become the best martial artist in the world, everything will come my way financially, which means that I will be able to provide for my family".The money was simply a by-product of being a very dedicated martial artist. How he found the time to do all the things he did, I've always been amazed by. 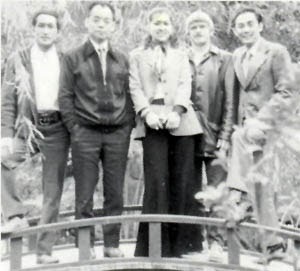 In December of 1972, Ted (far Left), Tae Kwon Do master Jhoon Rhee (second from left) and Herb Jackson (second from right) traveled to Honk Kong to visit with their friend, Bruce Lee (TM). This photo was taken on the bridge that crossed over a little pond in the backyard of the Lee family's Kowloon Tong home. I would like to get your thoughts on Bruce Lee's (TM) love for his wife, Linda. TED WONG: He loved his family tremendously and really, really loved his wife Linda. Most people don't realize that about Bruce Lee (TM). Linda Lee was the most important person in his life. Certainly she was the one who made him successful -- Bruce Lee (TM) told me that himself. People don't realize the credit that she should receive. I remember one time, it was after the success of his second movie, and Bruce Lee (TM) came back to California and stopped by my house. I gave him a ride over to Herb Jackson's house and as we were driving along the freeway, and he said, "You know what, Ted?" I feel that I am very, very fortunate and lucky to have Linda for my wife. All of those years when we were down financially and I was down emotionally, she never once complained. She even had to go to work when I hurt my back and couldn't support my family. I was so depressed at that point, and yet there she was --not complaining, but ready to support me. I feel that I will make it now. I've finally gotten to where I want to be, and it's solely because of Linda's love and support. I'm a very lucky man." The art of Jeet Kune Do (TM) underwent some significant changes from the Chinatown curriculum after Bruce began to teach privately in his backyard. In a related vein, Bruce Lee's (TM) daughter, Shannon, is now studying Jeet Kune Do (TM) under your instruction. And in speaking with Linda, she feels that is just great. How do you like teaching Shannon? TED WONG: Shannon has really inherited some genes from her father. She's got great form and she picks up things so quickly. You know, one person I really wanted to teach was Brandon. I wished I could have taught him all that I learned from his father, but I never had the opportunity except a few times when he was really, really little. But now I feel so fortunate that I have been given the opportunity to teach Shannon the art of Jeet Kune Do (TM), and I couldn't ask for anything better. I feel so honored and she's a really, really good student. A devoted friend: Ted still makes the trip to Seattle as often as he can to pay his respects to his sifu and friend, Bruce Lee (TM). On a personal note, you've often told me that Bruce Lee (TM) not only helped you as a martíal artist, but also as a person. I'm guessing that this latter category had to do with teaching you his philosophy. What part of his philosophy has influenced you the most? TED WONG: Bruce Lee (TM) always encouraged me to be myself and not to be afraid. He really changed me, the way I looked, the way I dressed. I used to wear a crew cut and was terribly bashful. I mean, I couldn't even get a date (laughs)! But Bruce took me and took me to a store and told me what shirts and pants to buy, and even took me out to get my hair styled. A complete makeover! (laughs) He gave me confidence. What he helped me with far exceeds what he taught me in martial art. He was a great person and he gave me confidence. Bruce Lee's (TM) love for his wife, Linda, was profound and heart-felt. He once told Ted Wong that he was "very, very fortunate and lucky to have Linda for my wife." Here the Lees smile for the camera at Ted Wong's wedding. Finally, Ted, as you were one of the people most instrumental in getting the Jun Fan Jeet Kune Do (TM) Nucleus started, I wanted to get your thoughts about the Nucleus, and what your thoughts are for the future of Jun Fan Jeet Kune Do (TM). TED WONG: I think the future is really, really bright. For the first time in twentysome years, I feel that the people who should be getting together have gotten together to preserve Bruce Lee's (TM) art. I've been hurting; honestly, I've been hurting for many years. There were many people out there who had been misrepresenting Bruce Lee's (TM) art to the point where, for years, it really hurt me. It's really fortunate that people like you and Linda Lee and other first generation students of Bruce Lee (TM), and members of the second generation of Bruce Lee's (TM) students have come together and pooled their resources and knowledge of Bruce Lee (TM) and his art, and are now working as one unit. I really am starting to feel that Bruce Lee's (TM) art will survive and come back again. There has been a lot of support and the people have been wonderful. Hopefully, through me and other members of the Jun Fan Jeet Kune Do (TM) Nucleus and through Jun Fan Jeet Kune Do (TM), people will now come to know Bruce Lee (TM) a little better, and come to appreciate and understand his art more fully.